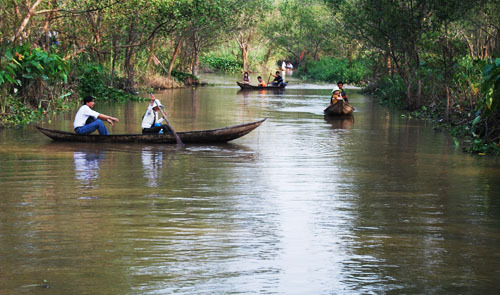 Going boating is one of the 'specialties' of tourism in the Mekong Delta, Vietnam. A workshop on science data for the Mekong Basin region will be held in Ho Chi Minh City from September 16 to 18, gathering around 50 environmental experts from the U.S. and six countries in the Greater Mekong region. “Science for a Sustainable Mekong River System” is being jointly organized by the Vietnamese Ministry of Natural Resources and Environment (MONRE), the U.S. Department of the Interior, the U.S.-based International Crane Foundation, and the Wetland University Network, which includes 18 universities in the Greater Mekong regional countries. The Greater Mekong region includes Cambodia, Laos, Myanmar, Thailand, Vietnam, and China (Yunnan Province). The primary goal of the workshop is to assess scientific information that can be used by government officials and others to validate, identify, and prioritize needed scientific studies in the Mekong River Basin, with a focus on sustainable river resources and dependent ecosystems. Vietnam’s University of Science Rector, Tran Linh Thuoc, will give a welcoming speech, while MONRE Deputy Minister, Nguyen Thai Lai, and U.S. Consul General to Vietnam, Rena Bitter, will give opening remarks on the first day of the event. Each workshop session will include presentations on a variety of topics, namely human and natural changes that are happening within the system, including climate change and river development; water quality and use; landscape use and change; surface water, groundwater and sediment; agriculture and forestry; improving data management capacity in the Mekong Basin; drought and flood management; threats facing the Mekong Region; how science can inform sustainable development; and others. Besides, each Mekong country representative will talk about data availability, gaps and data priorities, as well as national programs. The “Science for a Sustainable Mekong River System” workshop will take place at the University of Science under the Vietnam National University-Ho Chi Minh City.